ICL has setup a Real Estate & Prorperty Development Division (RE & PD) in June 1990 to provide housing for all sections of society keeping in mind its priority in national economy. The company's prjects for the decade include setting up of clean, healthy and self-sufficient townships and to build flats and aprtments in and around the city. 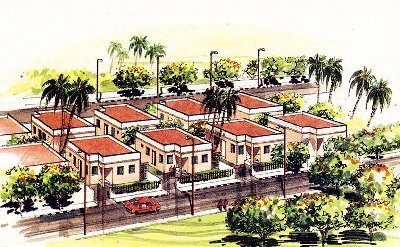 1) The division has developed a township in 14.30 acres at Noombal, Porur on the outskirts of Madras. The township has 64,216 sq.ft. of residential accommodation. The division also sold 1,37,137 sq.ft. 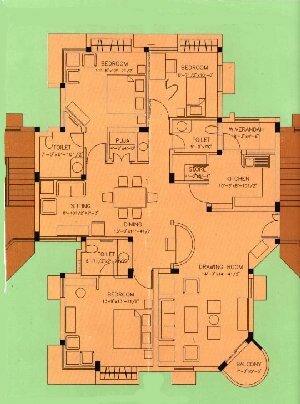 of housing plots. The Company has provided concrete roads, Street lights, park, shopping complex and other facilities in the township. 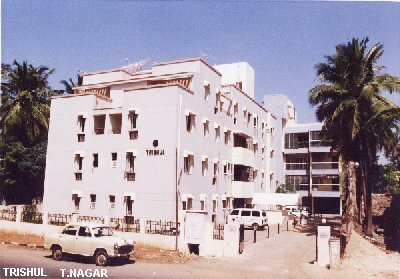 2) Trishul Residential Complex in North Boag Road, Chennai is an Apartment Complex of 12,510 Sq.ft. comprising 10 apartments. This project was completed in 1993 and handed over to the owners. 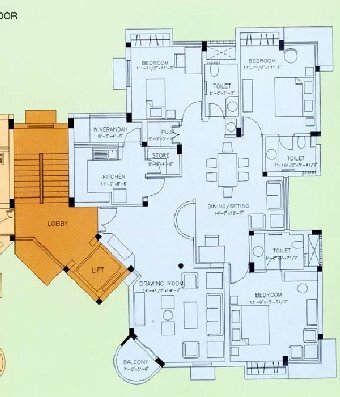 3) The River View Residential Complex in the exclusive Boat Club area, is an apartment complex of 25,632 Sq.ft. comprising 9 apartments. 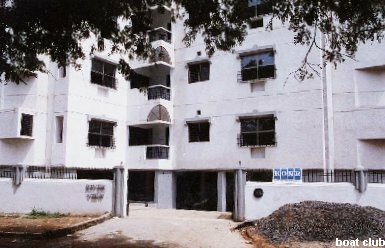 This prestigous housing complex, a much sought after residential area by foreign nationals, was compledted and handed over to the owners in 1995. 4) We have just completed the construction of a residential complex of 11,027 Sq.ft. 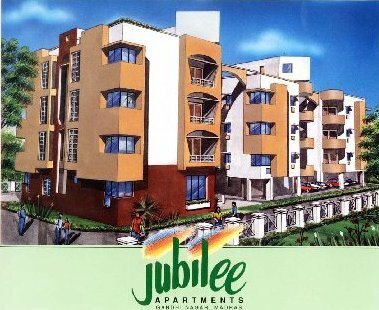 at Abhiramapuram, Chennai, comprising 7 flats and it is currently engaged in developing another Complex of 19,937 Sq.ft. 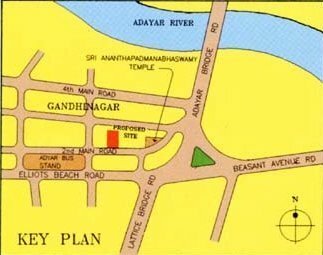 at Gandhi Nagar, Adyar, Chennai, comprising 10 apartments. Flats are available for booking only at the Adayar Project, on which information is shown hereunder. inclusive of one covered car park. Doors : First Class teak wood name and decorative teak wood panel shutters for entrance. Teak faced plywood doors with teak wood frame for other doors. Windows : Aluminum sliding shutters (Horizontal) fixed glass with aluminum frame. Iron grill fixed glass/glass louvers in teak wood frame. RCC Jallis. bedrooms, dress. Standard ceramic tiles for other rooms. closed shelves below platform., RCC pre-cast shelves. Store Room : Ceramic tile flooring, pre-cast RCC shelves. Wash Verandah : Ceramic tile flooring, ceramic tile dado upto 4' height. EWC with posh flush fittings. Shower; hot and cold water wall mixer, towel rod. Walls (External) : White/colour cement paint. Reddish-brown grit (exposed aggregate) plaster. Car Parking : IPS Flooring. One covered car park for each flat. Terrace : IPS flooring with water-proofing. 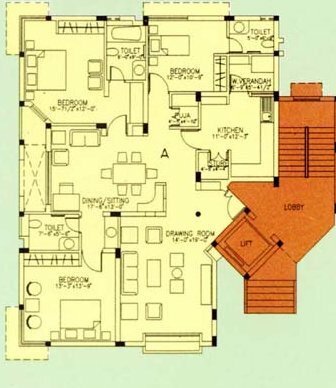 Bed Rooms : Adequate loft, wardrobe spaces. (exposed aggregate) plaster on outside walls. Additional Features : Excellent facial finish, dish antenna, landscaping, watchman cabin.